FLORHAM PARK - Mikie Sherrill's campaign to unseat Rep. Rodney Frelinghuysen, R-Harding, in 2018 gained some year-end traction Tuesday morning at the Florham Park Diner, where about 50 Democratic leaders in the 11th Congressional District gathered to pledge support. 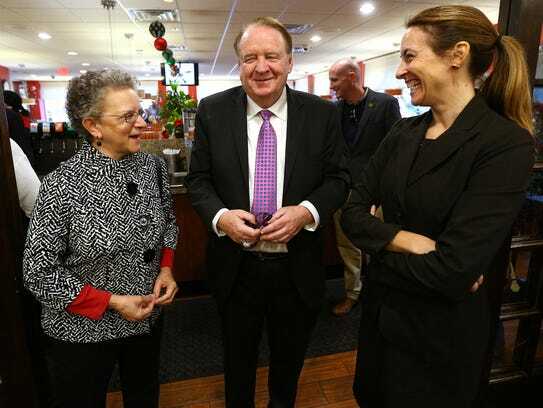 State Sen. Richard Codey of Essex County introduced the former Navy helicopter pilot, federal prosecutor and mother of four during a breakfast meeting attended by mayors, council members and county committee chairmen who believe Sherrill could be part of a dramatic, nationwide shift in Congress following the 2018 midterm elections. "In just six weeks, we're going to get rid of one bully," said Codey, a former New Jersey governor, speaking of outgoing Republican Gov. Chris Christie. "In three years, the next bully will go. Think of the opportunity we have in front of us." Turning to Sherrill, Codey asked, "How many seats do we need to change?" "Twenty-four," said Sherrill, of Montclair, who announced her candidacy in May. "To be one of 24 to change the direction of this country, on behalf of this great state, is an incredible opportunity that we have," Codey said. "When you do that, you change America for the better." Praising Codey as a man of compassion, and referring to Frelinghuysen, Sherrill said, "We have a congressman who is not fighting for us, who doesn't have that compassion. Who's taken a vote he admitted was bad for New Jersey, to take 23 million people off of medical insurance. Who has now sent a vote to the floor that will be crippling for our economy. So I want to go to Congress, in the mold of Governor Codey and Assemblywoman (Mila) Jasey, to fight hard for the people here." Jasey, who like Codey represents New Jersey's 40th Legislative District, said she is excited at the prospect of turning the 11th District and adding another woman to the roster of New Jersey representatives in Washington. Rep. Bonnie Watson Coleman (D-Mercer), representing the 12th District, is the only woman in Congress from New Jersey. "With all the things going on, nationally and on the state level, it's time for women to step up, to support each other and to make sure our voices are heard," Jasey said. "Mikie came to see me quite a while ago. We sat, we talked, I checked her out. She's the total package. She has what it takes to do this job." While some of the Democrats at the breakfast were voicing their formal endorsements for the first time, Woodland Park Mayor Keith Kazmark noted that he was the first elected official in the 11th District to endorse Sherrill, a political neophyte.